I’m writing these playthrough sessions during my holiday break, so today’s session feels very much in the spirit of the holiday. Freezeezy Peak is Banjo-Kazooie’s required snow world, something that you’d see from pretty much every 3D platformer at the time. Heck, you still see it to this very day. List off your favorite platforming world tropes! Grasslands, sandy desert, water world, lava pools, haunted houses, snoooooooooooow, they’re all here in some form or another. Well, except the water world gets flipped on its head with Clanker’s Cavern being a dingy place to be rather than something a bit more relaxing, and there’s no real lava world save for some area theming around Gruntilda’s Lair. Freezeezy Peak is solidly a snow level though, and I don’t mind it, partly because it wears its Christmas theme as strongly as possible. Weirdly, despite Christmas being a pretty widely celebrated holiday around the world, video games tend to shy away from using the aesthetic to its logical conclusion. With Freezeezy Peak, everything has a Christmasy feel to it with presents to find, a giant Christmas tree to light, and even jingly music playing. Rare might as well have called this world Christmas Town because dang is it Christmas. Strange that they didn’t go over the top and include Santa somewhere. Similar to Gobi’s Valley, Freezeezy Peak starts me in a small area that leads into the larger main area of the world, here giving me the option of sliding down a steep incline toward the biggest setpieces or turning right and inspecting a little house. Said house is filled with three sad little polar bears because they haven’t gotten their presents yet and their dad is lost. Luckily their dad is easy enough to find as he’s just a little ways down the path, laid out with a stomach ache since he ate a golden thing that he found. Yup, this polar bear named Boggy had the genius idea to eat a Jiggy just because he saw it lying around, though I guess it’s not outlandish to do since the animation for getting a Jiggy shows Kazooie swallowing the thing. Wait a minute, unexpected tangent here. Boggy is struggling because he ate one Jiggy, and he’s a big fat polar bear. Kazooie is running around worlds eating as many as 10 Jiggies per world, and she’s a skinny breegull who shows no problems. What’s up with that? Video games, man. Video games. In Freezeezy Peak, yet another water hazard is included. Instead of piranha-infested swamp water or liquid sand with sand eels swimming about, Freezeezy Peak just has really cold water. That’s it, no more explanation needed than “this water is freezing and you can’t step into it.” Credit where it’s due, they’ve at least taken the time to find some unique ways of recontextualizing the same hazard in multiple levels, and future credit when they do it yet again in the worlds to come. The main area features a giant snowman in the middle, climbing all the way to the top of the stage. The freezing water surrounds him with other setpieces sitting right outside that ring. 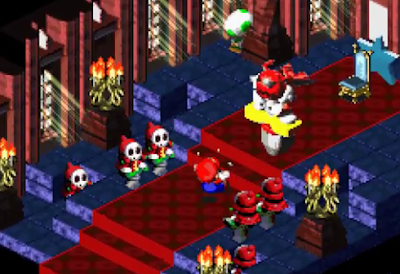 Also around that ring are gnarly snowmen who chuck snowballs at you while laughing. They have big red Xs on their hats, giving you the obvious weak spot, though the only thing that can take them down is a well-placed Beak Bomb. I actually really love using the Beak Bomb technique. On stationary targets at least. It feels particularly satisfying since you rocket straight forward “like a missile,” as Bottles puts it, and aiming is pretty simple since when you’re flying you just have to line Kazooie’s head up with the spot you want to slam into. Best of all, the technique takes some skill to perform it correctly as lining up your shot is imperative to actually hitting it and not overshooting, resulting in a slam into the ground or a wall. Taking out each of the snowmen makes the overall area much easier to explore, unless you enjoy constantly dodging snowballs. To each their own. More credit to the devs at Rare, putting Boggy’s children at the very beginning of the world to give you the present quest was a very wise decision. They could have easily been a landmark you stumble into later on in the world, but here since they’re in what’s likely the first house you explore, you’ll be primed to keep an eye out for the three presents, none of which are overly hard to find but feel like a nice reward when you do track each one down. On the opposite bank sits a little village with three houses and Mumbo’s skull. I never really thought about it, but these houses are really tiny, so either Banjo is really big (as a bear, that’d make sense), or I should stop trying to make sense of the game with witches and a shaman who changes a bear and a bird into various other animals. Not far from these houses is a cave with a dopey walrus guarding the entrance. This is Wozza, and he’s afraid of Banjo for one reason or another. He’s also waving a Jiggy around like he doesn’t really care who knows he has one, a practice that in any other game would get him a mauling. Thankfully for him he’s in Banjo-Kazooie where the worst that can happen is a witch makes you ugly. Or a bear stomps you and severs all your limbs in the process. OK, maybe he’s not as safe as I once stated. With the small snowmen tackled, it’s time to trek up to the top of the giant snowman. Though he has a face, he’s another non-sentient being, or at least he’s so far above everyone else that he can’t be bothered to talk to the lower lifeforms. Makes me wonder who built this snowman. Who was large enough to make a snowman that stands taller than just about everything else in the game? Questions without answers. Using the flight pads scattered around the world, I’m able to flap all the way to the top of the snowman’s hat to retrieve a Jiggy earned for defeating all the snowball-hurling snowmen. There’s also an ice cube enemy that splits in two when you attack it, a new concept for this area. The snowman is adorned with a long red and yellow scarf that has music notes on each yellow segment and red flight feathers on every red segment. He also has the classic carrot nose and a corncob pipe which has a Jiggy hiding inside if you’re careful enough to walk the narrow handle and into the...bowl? I just now realized I’m not clear what the elements of a pipe are actually called. Strange blindspot to just now realize. No I’m not going to look it up either. Some blindspots are needed to make a full person, though it will undoubtedly be a question in a critical game show moment years down the line for me. At the top of one side of his scarf is a little sled. Jumping on it starts a scene where Banjo rides down the ramp and launches off, landing on Boggy near the entrance to the world and dislodging Boggy’s poorly eaten Jiggy. Boggy doesn’t waste a ton of time before bogging off to not take care of his kids. This lets me reset my attention to the big Christmas tree down the entrance path and to the left. A present box jiggles around, just begging to be interacted with. Stomping it pops it open, letting the Twinklies free. Twinklies are little sentient Christmas lights, a fact that shouldn’t be shocking considering how many other things are sentient, including the random item pickups that tell you what they are the first time you pick them up. To get the Twinklies onto the tree, I have to perform a little mini game where Twinklies pop out of the present box and run down a path toward the tree. Reptilian monsters called Twinkly Munchers poke their heads out from three holes along the path and eat the glass Twinklies. All you have to do is stomp the three before a Twinkly gets eaten to create a safe path for at least 10 Twinklies, all in under 100 seconds. But before the lights are turned on, I have to go behind the tree and shoot three eggs into the ON switch conveniently placed there, and then fly through the star on the top of the tree three times in 60 seconds, a task that’s not super difficult because plenty of time is allotted, but one that could have been hair-pullingly frustrating due to the imprecise nature of the flight controls. With the lights on at last, I’m able to jump inside the tree and go collect the Jiggy at the top. One fun detail is that there are termite enemies inside the tree, meaning this tree is doomed faster than most Christmas trees. Cute, simple, I like it. I’m in a flight mood, so I take to the air yet again, this time to Beak Bomb the giant snowman’s three buttons, which all look like targets. Nice not-so-subtle gameplay clue that I think works perfectly well considering nothing is told to the player that would lead them to try Beak Bombing the buttons unless they were targets and thus begged to be Beak Bombed. At this point I’ve found all three of the polar bear children’s presents, so I Talon Trot back there to deliver them. My four-year-old brought up something that I hadn’t considered in that we never actually find out what are inside the presents. He was adamant that we’d see the bears open them, and I was pretty sure I remembered them not opening them, a detail I was correct about. I do like that the music inside the polar bears’ igloo changes from a very somber sound to an upbeat version as soon as all the presents are delivered. My son still believed that if we visited them later we’d see what was inside those presents, and he shouldn’t be wrong, but he is. Life is full of disappointments, kid. That just leaves a few niggling little tasks to wrap up, requiring me to finally enter Mumbo’s skull and get another animal transformation. The transformation dejour is a walrus, a very disappointing transformation all things considered. I’m actually putting this at the bottom of the transformation list as the walrus’ only ability it to slosh through the icy water without taking damage, meaning it’s essentially just a worse version of the gator from Bubblegloop Swamp. You don’t even need to take it into Grunty’s Lair, it’s that underwhelming. What it does do is let me enter Wozza’s cave since Wozza is a very poor judge of character. He also gives me his Jiggy, which, OK, that’s a good host. I take it back, Wozza. He lets me splash down a small watery hole in his cave to this world’s second honeycomb chamber (the first found after defeating one of the Beak Bombed snowmen). Now that I’ve done everything there is to do as a walrus, I can change back into bear and bird and clean up the last remaining things in Freezeezy Peak, including busting into Wozza’s cave uninvited and messing up the place. I guess since he’s given his Jiggy to a random stranger walrus, he’s letting absolutely anyone into his cave. I do like that despite him freaking out, he resigns to his fate and just ask you to take the annoying orange thing when I leave, that being a Jinjo. 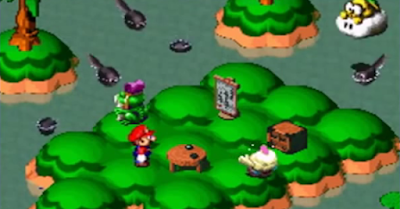 Up by the Jinjo is also a pathway into a little cavern that contains the ice key, an item that has absolutely no purpose and that you couldn’t get unless you did the Stop ‘n’ Swap cheats. Add that to my list of Stop ‘n’ Swop things to figure out once I’m done with the game. Finally, we head back to Boggy for a rematch sans walrus form. For this version of the race, we have to use the Talon Trot combined with the running shoes, meaning that if we hadn’t unlocked their use in Gobi’s Valley, we’d have been unable to complete this world now. A little pro tip for you on this race: start the race in the Talon Trot as you sprint to the running shoes. This saves you from having to go into the default animation for putting on shoes and doesn’t lose you any momentum. Still, I don’t much like this rematch. Boggy is a lot faster, but the track hasn’t changed. I feel like I’m also going faster, but now if I make a mistake due to the camera not really keeping up over the houses and across bridges and I fall into the water, I’ll take damage and lose time. It actually took me three attempts to win this second race, but when I do I take Freezeezy Peak’s final Jiggy as my reward. Wait, side tangent again. Boggy has two Jiggies as medals for winning his races, yet he eats a third one that he just finds lying around. I never really thought about that until now, but that either doesn’t make any sense, or Boggy really is that stupid. Considering how much of a jerk he is when you see him in his house, annoyed that his kids are so happy and jumping with joy while he just wants to sleep, yeah, I’d believe that Boggy would be that dumb. That’s one bad dad right there, kids. Don’t be a Boggy. Freezeezy Peak adds another 100 music notes, 10 Jiggies, five Jinjos, and completes another health honeycomb for me, all in about 38 minutes. The time feels pretty consistent here, which I suspect will shift for the latter three worlds of the game as those ones are a bit longer and more complicated, especially the final world. Right outside Freezeezy Peak is a quick dash challenge to get to the flight pad that allows me to access the Jiggy spawned from stomping Freezeezy Peak’s Witch Switch. In theory this challenge is simple. You have to climb the outer exterior of the world’s entrance through holes that somewhat resemble an advent calendar, though with a big image of Banjo’s and Kazooie’s faces (more curious inclusion). A little ways up you find a switch that makes a flight pad appear and some running shoes to help you get to it in the 10 seconds you’re given before it disappears. Trouble is, the camera will fight you here and doesn’t necessarily want to shift behind you to let you see where you’re running. Plus, getting to the flight pad even a split second too late means you can’t use it. It took me three attempts to get to it and reach that extra Jiggy. Pushing deeper into the lair brings me to the puzzle panel for the next world, Mad Monster Mansion. I’d already seen the entrance a bit back, but couldn’t remember where to actually open it up. There’s a fun sort of problem to solve while playing since you can find the entrances to worlds relatively easily but sometimes have to go hunting for the means to open them. Gobi’s Valley, for instance, requires you to travel two rooms past where its entrance sits in the lair just to open it up. For reference of rough progression, the most recent note door I’ve encountered wants me to have at least 450 notes to pass through. I have 600, so no problem. I also have 67 total Jiggies, so no worries there either. Next time things move from Christmas to Halloween with the haunted Mad Monster Mansion. Come get spooked!